A downloadable PDF of this information is available. Extremes and extremely big storms: how changing physics impacts statistics in coastal engineering. While often assumed and applied that extreme event magnitudes can be estimated from measurements, hindsight often offers different outcomes far exceeding our expectations. A recent example involving wave height was seen at Niue where previous “measurements” would have underestimated the risk of wave damage to houses on top of a near vertical cliff 22m above MSL. A polar accelerating tropical cyclone in phase with growing waves (i.e., increasing group celerity) was able to keep the cyclonic winds on the growing waves (typical waves generated by cyclonic winds outrun the wind field, a mechanism that limits their growth). This in phase phenomenon lead to an estimated doubling of wave height compared to that expected for the TC intensity involved. While this is a dramatic version where the more common events look very different to the extreme events, other examples are found for storm surge and wave run- up. The talk will address how to incorporate these different events into statistical modelling by a simple analytical example that qualitatively explains the empirical shapes found in the NSW storm surge measurements. Some generalisation will be suggested to handle more complex scenarios. Compound extremes: quantifying interactions between catchment flooding and storm tides in the coastal zone. Climate and weather related events such as flooding, heatwaves, wildfires and cyclones pose significant risks to society. The overall impact of these events is determined by the interaction of many processes acting together, where the manner in which the processes are combined is often just as important as the state (extreme or otherwise) of each of the driving variables. This presentation will aim to provide an overarching framework to understand such extremes, focusing on the specific case of coastal flooding as an example of a complex system with many interacting variables. 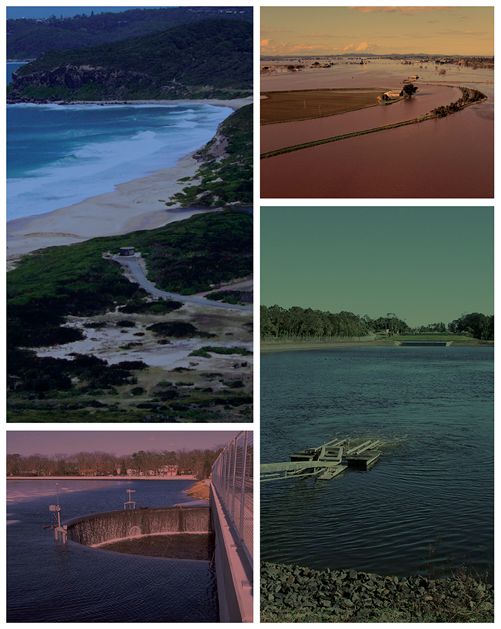 The complexity in such systems arises because floods in estuarine and coastal areas can be caused by both catchment runoff as well as storm tides, and thus both are important in evaluating flood risk. Furthermore, storm surge is largely determined by atmospheric pressure and wind anomalies and thus can be triggered by the same meteorological conditions as intense rainfall events. The diversity of possible interactions which cause such climate extremes suggest that new methods for flood estimation are required that better capture these dependencies, in order to develop more accurate and precise estimates of flood risk. Before joining the University of Queensland, Dave Callaghan held positions within industry including Parsons Brinckerhoff and Lawson and Treloar and research sector including Nederlands Instituut voor Ecologie and the University of Queensland. He is the author of a book section and more than 50 other technical documents with applied and research applications. He is recognised for leading edge research in coastal engineering including statistics of extremes, beach erosion from extreme events, physical and biological interactions of salt marshes and coral reefs, lagoon dynamics and wave propagation. Seth Westra is a Senior Lecturer at the University of Adelaide, and has over eight years of industry and research experience in fields of flood hydrology and hydroclimatology. Seth’s recent research has focused on better understanding the hydrological extremes of flooding and drought under a variable and changing climate, as well as understanding hydrological events which are caused by multiple forcings.